I saw an ad for some kind of waist trainer recently. 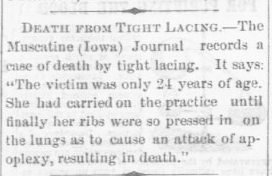 I’m not so sure that practice is such a good idea, for several reasons. 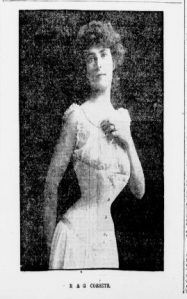 For women in the late 19th and early 20th centuries, tightly lacing a corset to achieve an hourglass figure was still very much popular despite a movement to end such an unhealthy and uncomfortable trend. 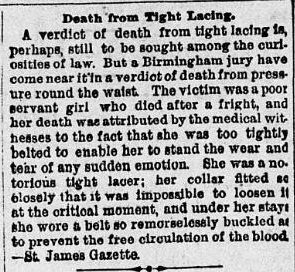 Here are a few news accounts of women who actually died (or were said to have died) due to the wearing of this fashionable undergarment.